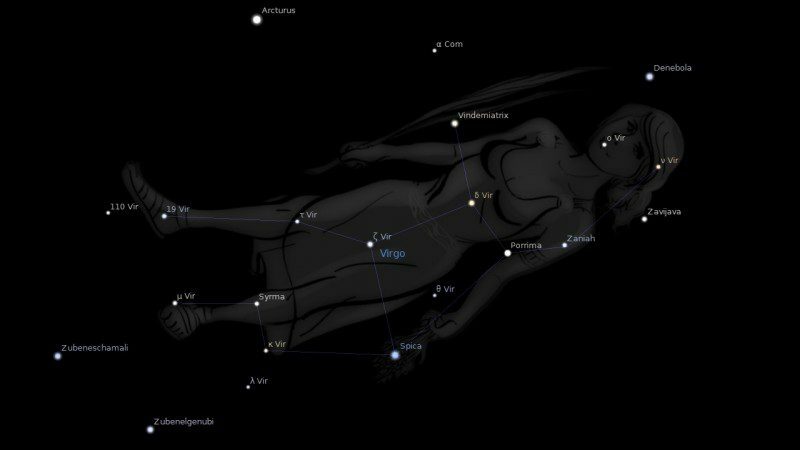 Fixed star Zavijava, Beta Virginis, is a 3.6 magnitude yellow star on the left side of the Head of the Maiden, Virgo Constellation. The traditional name Zavijava comes from the Arabic word زاوية العواء zāwiyat al-cawwa’ which means Corner of the barking (dog). Another name was Alaraph. The second star of Virgo by Greek-letter rating, β Virginis, is not actually the second brightest; its current visual magnitude is 3,8, whereas there are several others between 2.9 and 3. This star is alternatively named Zavijava or Al Araf (or Alraph). It is not surprising that that Ptolemy gave it the very Leonine qualities of a Mercury-Mars star. Of the names, Zavijava probably derives from Al Zawiyah which among other things means a small Mosque subsidiary to a larger one nearby. Since such a Mosque is very much a symbol of authority in its locality, as a parish church is in other communities, the idea conveyed here is of someone holding a position of command but subject to a higher command behind them. Al Araf conveys the same notion in another way, being a much diminished corruption of an original which meant: ‘Those who send forth (others to carry out their orders)’, or: ‘Those who are Sent forth…’.That seems a very logical notion for the star which carries us on from Leo, symbol of commanding others, into Virgo where we work for those who have command over us. The Mercury-Mars quality perhaps suggests more of the Leo nature, the intelligent director behind the action, but the name can just as well imply that ‘the successful applicant will work in the field on his own initiative, directly responsible to the M.D.’, as current top-job adverts put the matter. The planetary smile therefore suggests one who has the intelligence and energy to be sent out and not need a higher authority to lead him all the time. And so the qualities we find in people with this star very precisely engaged upon their horoscopes (it is faint, with small orb), are those of a reliable worker, attentive to every detail of the job, able to control this if the star and its companion planet is well aspected, so that he will make a good salesman, executive, manager or subordinate commander, but needs someone of higher rank to have given him the job. If less well aspected he can be the sort of underling who provokes his men to strike or mutiny by over-playing the ‘little Hitler’ act. His own downfall is then assured. If he does have that harder aspect there, however, he can best use it by avoiding controlling others, taking on instead something like painstaking research in difficult fields where there are few people or sources to guide him. 1. Fixed Stars and Constellations in Astrology, Vivian E. Robson, 1923, p.66, 219. 2. Fixed Stars and Judicial Astrology, George Noonan, 1990, p.45. 3. The Living Stars, Dr. Eric Morse, 1988, p.67. 4. The Fixed Star Health and Behavior Imbalance, Ted George and Barbara Parker, 1985, p.74. 5. Star Names Their Lore and Meaning, Richard Hinckley Allen, 1963, Virgo. oh wow ! this one is close enough to be in conjunction to natal saturn (27.02). Natal saturn makes an oppostion to natal moon which is also in conjucntion with another fix star …. I need to think about this one!